We recently received a tweet from Aleena Naylor of BBC Radio Derby asking us if we'd do a live radio interview on her morning show about camping and the trend for staycations. At that point, Mr AvailablePitch became a small dot on the horizon, which left yours truly in the hot seat. Of course the answer was "Yes" and after a 20 minute initial chat on the phone with the lovely Aleena, I was booked for 10:15 am the next day. Then nerves set in and the "What-ifs" started: What if the traffic was bad and I was late, what if I froze and didn't know what to say (Mr AP thought that HIGHLY unlikely), what if it was less Richard and Judy and more Paxman or Humphries??? Out of my comfort zone? You bet! Yet I did it. I really did. And it was absolutely FANTASTIC. Aleena immediately put me at ease, and it was just like a happy chatty gossip with a really good friend. I guess that's the sign of an excellent interviewer. And so for twenty minutes, we chatted about all things camping and caravanning and I was able to help promote the camping and caravanning industry in general, and in particular, the many smaller, independent and unusual campsites that are registered with AvailablePitch, getting a special plug in for those sites located in Derbyshire and the Peak District as an added bonus. To listen to the interview, please visit our Facebook Page. Aleena indicated that she may like to have me back in future to discuss other camping related topics, so who knows, maybe a whole new career on the radio beckons?! For now though, it's down to earth and back to blogging, Facebooking, tweeting, emailing, re-vamping AvailablePitch, and all the other stuff we do to promote all the campsites who are registered with us. 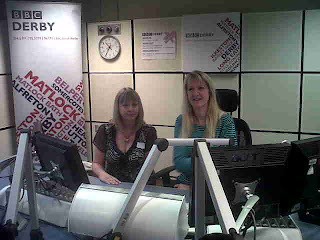 Above image: Catherine Simpson, AvailablePitch.com and Aleena Naylor, BBC Radio Derby.